Martinique is an island in the Caribbean Sea, and is an overseas region of France. It has an area of 1,128 km². Nearly 400,000 people live there. The capital city is Fort-de-France. 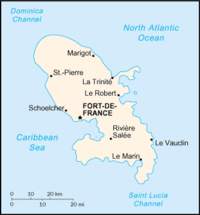 Other towns include Sainte-Anne and St. Pierre (which was destroyed by a volcano named Mont Pelée in 1902). Martinique is well known for its zouk music. Artists such as Kassav have made it famous over the years. The ethnic makeup of the country is: 90% African and Mixed African with anything from Chinese, East Indian or White. and 10% White, Amerindian, Chinese and East Indian. Wikimedia Commons has media related to Martinique. This page was last changed on 24 June 2018, at 19:17.